I think this is the closest Barbie ever came to a Moo-Moo! 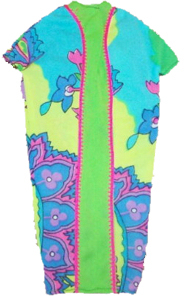 The bright, mod colored caftan is done in a paislet priny. There is a wide green front panel with hot pink trim. It is a slip over style with a V-neck. 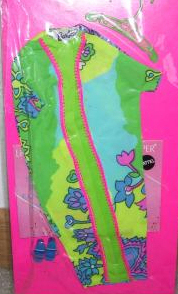 This is fairly easy to find and they are usually in great condition - it is hard to destroy nylon!